James Orville was born in 1864 in a Shellrock Township, Minnesota, one of seven children. His family were farmers who later moved to Glenville, Minn. Early on in his life Booen decided not to follow the family tradition of farming and broke away, becoming an itinerant photographer. Before arriving in Washington, he had already traveled through North and South Dakota, Minnesota, and Yellowstone and Glacier Parks. Booen has been described as an adventurer, a person who "didn't conform to any special place." He was not quite a black sheep, but relatives remember his mother calling Booen a "dandy". By contrast, Booen's wife Cina was a stern woman. Booen was based in Chilliwack from 1895 to 1897. After leaving Chilliwack in 1897, the Booen family must have gone back to Booen's hometown of Glenville because their oldest son, Charles, died and was buried in the family plot there in 1897. By 1914 the family was settled in Miles City, Montana, where they owned a home and a studio. Both Leslie Clair and Leon served in WWI, Leon dying from his wounds after the war in 1923. Booen died in 1934. The day he was interred his granddaughter, Katherine Booen, arrived in Miles City to locate her father, Leslie. None of the family, including Leslie, knew that she existed. Leslie had moved to New York ca. 1919 and married an opera singer, but the marriage was not a success and Leslie came back to Miles City, unaware that his wife was pregnant. Katherine, unhappy at home, hitchhiked across the country at the age of 14 to find her father. Leslie did not stay long in Miles City. He moved with his mother to San Diego where he died in 1945. Cina died in 1952. They are all buried in Miles City, Montana. Photograph consists of portrait taken of a group seated around a table, having tea, outside of the Hulbert house in Sardis, ca. 1896. 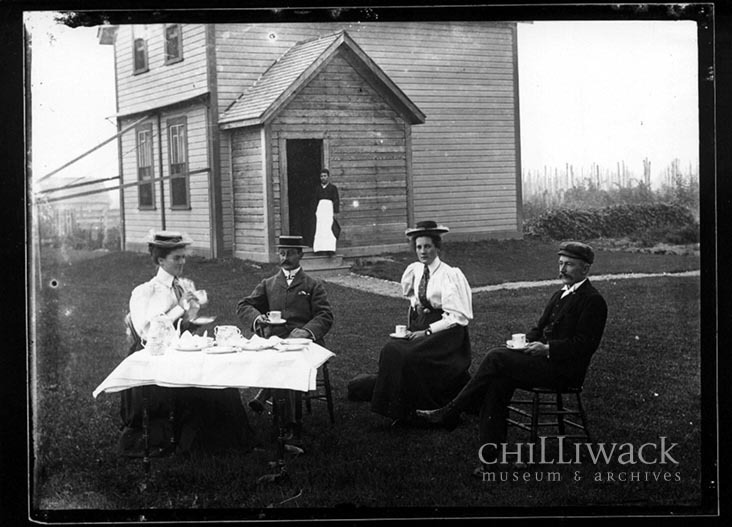 Individuals identified in group include, from left to right: Rachel McLeod (holding tea cup), Joe Banks, unidentified Chinese servant (holding tray and wearing apron), unidentified woman, Joe Arnold. Fields of hops visible in background behind house.